One of my favourite aspects of cake decorating is the opportunity to make cakes that surprise and delight the recipient. I love the oohs and aahs, and broad smiles that happen when people open the box containing their bespoke cakes. Last week my niece turned 21. Hard to believe when it seems like only yesterday that she was learning her first words and doing little more than crawling, feeding or sleeping. Now that she is grown up she didn’t want a traditional birthday cake. Instead she requested vanilla cupcakes for her party. 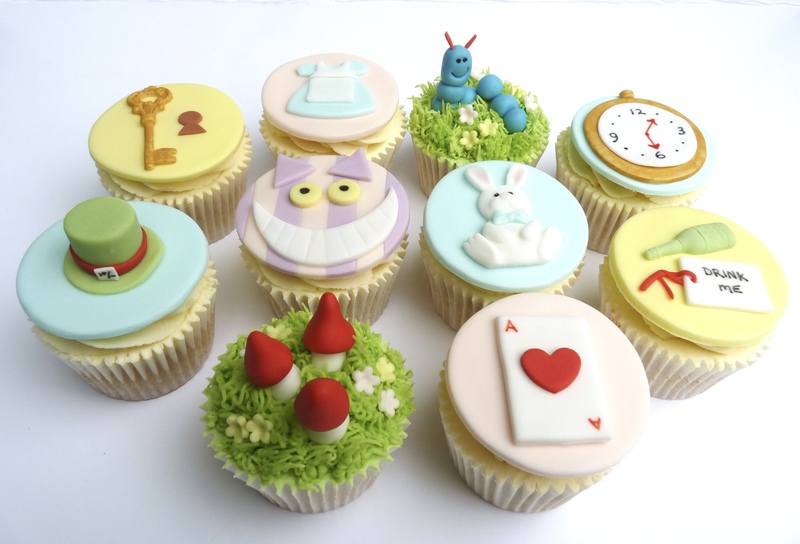 And rather than candles, she asked for her cakes to be decorated with an Alice in Wonderland theme. What a great idea! Her selection of cakes included a cheshire cat with a cheesy grin, a white rabbit, a gold pocket watch, a caterpillar with jaunty antenna, magic mushrooms and an Alice dress. I managed to get this quick photo before the cakes were whisked off to her party. Don’t they make a cute collection? My niece certainly thought so. Birthday cakes befitting a beautiful young lady. These are so pretty Jen! Thanks, Sam. My niece thought they were pretty special too.